EMPLOYERS in Singapore are facing three pressing human capital issues, according to Randstad Sourceright's 2015 Talent Trends Report: the management of a multi-generational workforce, high talent mobility, and critical talent scarcity. Doug Edmonds, regional director of Randstad Sourceright Asia Pacific, said that against the backdrop of critical talent scarcity in Asia, businesses are under increasing pressure to upgrade their talent management strategies to combat the human capital challenges they face. 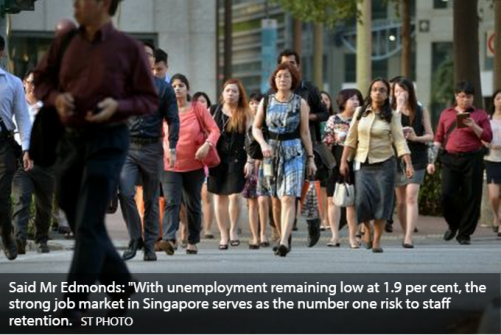 Said Mr Edmonds: "With unemployment remaining low at 1.9 per cent, the strong job market in Singapore serves as the number one risk to staff retention. Last year, in a sign of the increasing competition for global talent, worker mobility around the world continued to climb to new heights. "Our research shows that nearly one fifth of employers plan to recruit from overseas because of talent scarcity. That figure jumps to 33 per cent for companies based in Singapore," said Mr Edmonds. Even so, he noted that employers can also exploit mobility as a talent engagement tool. "(They can) incorporate it into their employer brand, with assignments in different geographies being a big motivator for employees to develop skills and boost their careers. Employers also win - benefiting from the new skills and experiences their internal talent gains across different geographies and cultures." Randstad Sourceright's report, launched on Wednesday, "explores the top 25 global trends shaping the world of work and their implications for HR (human resources) and talent management". It surveyed 350 global HR and talent acquisition leaders - 62 per cent of which have responsibility for countries in Asia Pacific.